Just as interesting as the wildlife above is the textbook lesson on seed dispersion playing out beneath. 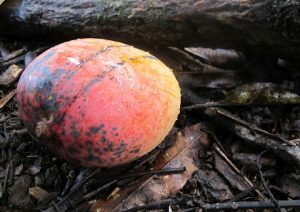 Some mangoes are carried away in the mouths of agoutis (Dasyprocta punctata) or the hands of humans, and later discarded far from their mother tree’s sphere of influence. But most never make it that far. Within minutes, any fruit whose protective skin has been damaged by the fall or pierced by sharp beaks begins to attract insects. Ants, flies and beetles work quickly, and the decomposition process they begin is sped along by bacteria, fungi and yeasts that turn the ground below each tree into a slippery circumference of rotting fruit. Some of the seeds, once stripped of their sugary flesh and reduced to fibrous remains, now sprout in an unlikely attempt to one day challenge their elders for light and space. This past month’s crop provided us with not only a momentarily bottomless source of fruit and some very convenient wildlife watching, but also a reminder of the ways that human and natural histories are intertwined. Mangifera indica – a member of the Anacardiaceae family, which also gives us poison ivy and cashews – has its evolutionary origins in India. The coveted fruit was transported to the New World centuries ago and has firmly established itself on these shores. Mango is now considered a “naturalized” native of the Americas, and its yellow-orange drupes are an important food source for many species of birds and mammals. 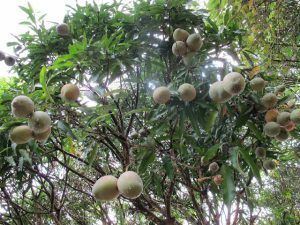 Throughout the tropics, mango can be found growing not only in backyards but also in apparently ‘wild’ forest areas, a sign of their previous human habitation and land use. The grove of giant, mature trees that make up GGCC’s mango orchard grow along a gentle slope down from our main buildings. These trees’ sprawling, graceful form and even spacing are evidence of having been planted and thriving under direct sunlight with lots of room to spread. 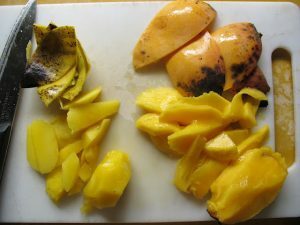 Moreover, several different varieties of mango can be found in the grove, and lemon and orange trees are interspersed among them. Large stands of a non-native bamboo species are found around the perimeter. The land where GGCC’s buildings now stand was cleared by a family of Costa Rican settlers in the 1970s, and this family raised cattle and planted fruit trees and garden crops for decades. Before they sold it, in the late 1980s, they also altered the landscape by putting in plantations of trees such as teak (Tectona grandis) – native to Southeast Asia – and pochote (Bombacopsis quinata) – native to drier climates here in Mesoamerica – in hopes of producing profitable timber species. Later, when Osa Conservation purchased the property, subsequent owners had already initiated plans to convert the hilltop into luxury hotel villas. Osa Conservation’s work at GGCC is focused on restoring much of the original forest habitat that was cleared for cattle or converted to plantations. 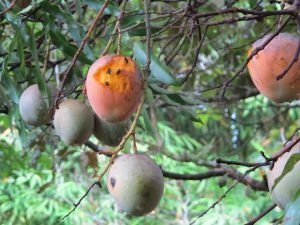 But restoration to an “original” state is not as simple as it may seem: if we were trying to go back 1000 or even 100 years, for example, we would have to remove the mango trees that now provide so much food and habitat for wildlife. All conservation land managers must make decisions in order to maximize the ecological benefits and services they deem most valuable. For Osa Conservation, restoration includes taking out most of the teak plantations, as teak is a recently transplanted non-native species that provides little benefit to wildlife in the way of edible seeds or leaves, is not conducive to understory regrowth and resprouts from its stump if not removed completely (some of the very aspects that make it an attractive plantation species). Our pochote areas, on the other hand, have grown over 20 years to resemble secondary forest, with many tree and herb species re-establishing themselves below the canopy and a diverse bird, bat and wildlife presence. We have therefore decided to reforest the pochote patches through enrichment planting among the existing trees rather than removal. We certainly intend to keep the mango orchard, which appears to be well appreciated by all! This entry was posted in Miscellaneous and tagged Andrea, biodiversity, Johnson, Mangoes, Mangos, osa, Peninsula. Bookmark the permalink.